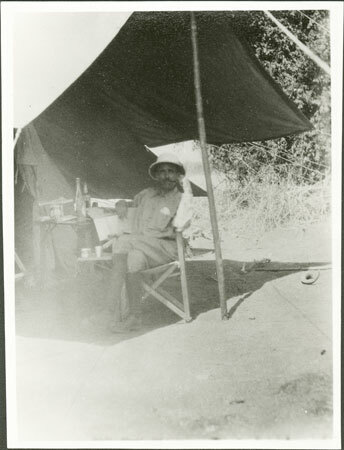 A man wearing a pith helmet and smoking a pipe sitting in a camp chair under the canopy of Evans-Pritchard's tent with a map open on the table in front of him. He is identified as an Austrian Count. Although this might suggest that he could well be the Austro-Hungarian noble László Almásy (1895-1951) who made several trips through Sudan in motor vehicle during this period, it seems that he was in Sudan in 1929, before Evans-Pritchard's Nuer fieldwork. The co-incidence is strong, but there are also differences in appearance, which seems to point to another Austrian Count. Note on print reverse ms pencil - "31/7 127 "
Morton, Chris. "Austrian Count in Evans-Pritchard's tent" Southern Sudan Project (in development). 03 Jan. 2006. Pitt Rivers Museum. <http://southernsudan.prm.ox.ac.uk/details/1998.346.127.2/>.